These are perhaps the most classical of all the drivers of Forex rates. Long-standing economic doctrines tell us that money flows to wherever it can receive the best return regardless of whether that flow of funds is between bank deposits and bonds, or between two competing currencies. Unlike shares or bonds, currencies do not pay dividends or coupons, but they do offer, or at least are priced to reflect a return, in the shape of the base (interest) rates that apply in their home economy. Theory dictates that money flows into a currency that offers a better return, and the value of that currency will rise, in comparison to those peers, that offer a lower return. This is a simplistic example of course, but it’s a good starting point. Headline interest rates are only part of this equation, as they form what is known as the nominal return on a currency, whereas International capital is only interested in real returns. Simply put, the real return is the nominal return minus the prevailing rate of inflation. Inflation is said to erode the purchasing power or value of money over time such that interest rates need to be equal to, or above inflation rates for money to retain its value or appreciate. Having established those relationships, we can now consider the role of the central bank. In modern developed economies ,central banks act independently of their national governments who provide them with a framework of policy goals. That framework may include targets such as creating full employment and keeping inflation at or below a figure (for example: 2%). The Central Bank will use the monetary policy tools at its disposal to try and achieve those targets and will communicate it’s intentions to the markets. Traders use this information to predict the likely future path of interest rates in a given currency and compare these predictions to those of its peers. Such comparisons allow the markets to form an opinion about the relative values of two currencies and create a valuation or price, also known as a rate between two currencies, and indeed this is the basis for Forex trading. That predicted future path of interest rates is described by what’s known as a yield curve. 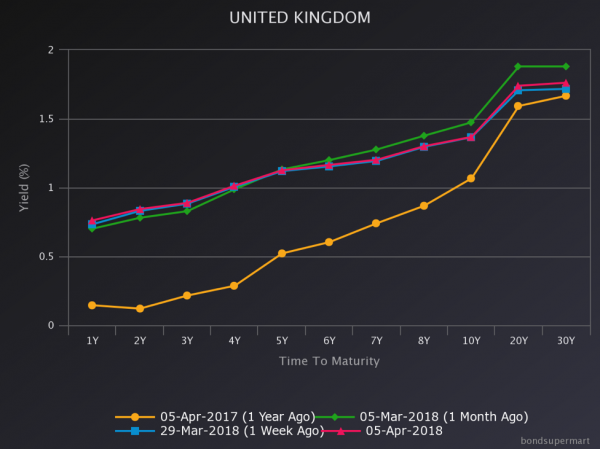 In the chart below we can see the evolution of the UK yield curve over a variety of time frames. A yield curve and perceptions about future levels of interest rates are fluid situations that are subject to frequent change. Macroeconomic data is the lifeblood of the modern markets. Economic data is tailor-made for the internet and DMA trading, and the two go hand-in-hand today. It will come as no surprise to find that economic data releases move the markets. Even if you rely on technical analysis to drive your trading, you will still want to pay attention to key dates and times on the macroeconomic calendar. This is simply because those are the points when you are likely to experience fluctuations in FX prices. Those fluctuations in price represent trading opportunities. Economic calendars rank data releases by their likely market impact or volatility, the higher the volatility, or impact associated with the release, then the more importance it assumes for traders. Such ranking systems focus on the immediate price impact, rather than anything longer term. But that tends to suit leveraged traders, whose time horizons are typically on the shorter side. Given the sheer number of economic data releases (on the day of writing, for example, there were 36 scheduled items for the markets to consider), traders have had to develop techniques that allow them to process high volumes of new information. One such methodology is to consider the levels of deviation in this data from both prior data points and the consensus forecast among financial analysts, for a particular data point. The degree of change or deviation from prior readings for the same data can highlight trends in that data. 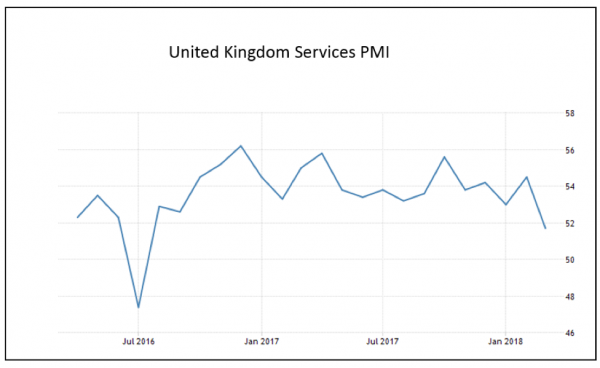 For example, the chart below shows us the trend in UK Service Sector PMI. PMIs are a measure of economic activity, readings above 50 denote expansion and those below 50 show contraction. 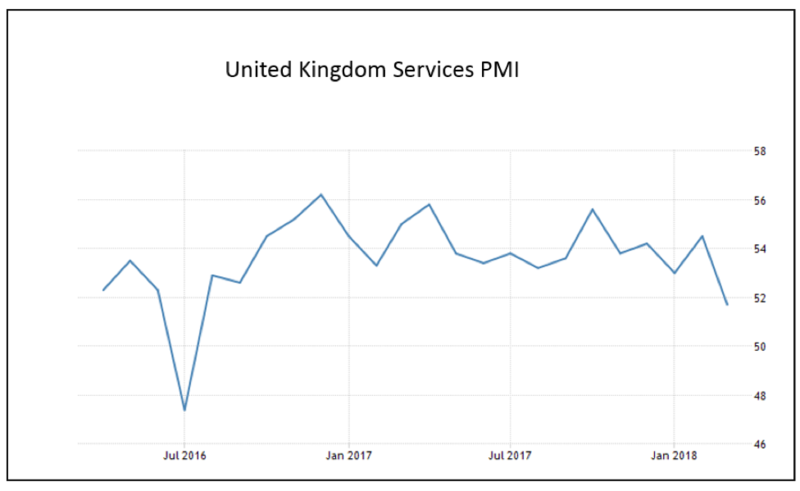 As we can see below, growth in this key part of the UK economy had been slowing since the Autumn of 2017, and the March 2018 numbers revealed a steeper decline still. Markets are forward-looking, and FX markets are no exception. So it follows that financial analysts will try to predict or forecast the values for future economic data releases. That process creates another benchmark, against which to measure variations in the data. In this case we are are trying to gauge levels of surprise. The bigger the deviation in a data point from the combined or consensus forecast, then the bigger the surprise. If we see data releases above estimates, that can be thought of as a positive surprise. On the other hand, data that comes in below consensus will be characterised as a negative surprise. US bank Citigroup has taken this exercise a stage further, creating indices which track the degree of positive or negative surprises for data releases, in major economies. The chart below plots their Economic Surprise Index for the Eurozone out to the end of March 2018. As we can see on the right-hand side of the chart, following a period of positive surprises and a rising plot, things took a decided turn for the worse, and we quickly moved to a point where Eurozone data was constantly undershooting forecasts. In summary, this chart tells us that analysts were too optimistic about Eurozone data in the first quarter of 2018 and it’s perhaps no surprise that upside momentum in the single currency eased during this period. The macroeconomic data releases discussed above can be aggregated to provide traders and others with a holistic view of an economy and its prospects. This macro profile feeds directly into perceptions about the future path of interest rates. A factor which can exert significant influence over FX price formation. But in some respects, an FX rate is also a gauge of how much markets believe in an economy. Or if you prefer, how much confidence there is in that economy’s ability to perform, and to meet its obligations. Those obligations include the provision of public services, such as healthcare, education, benefits/pensions etc. As well as servicing and repaying outstanding debt. In this respect, economies are not so different to individuals or households. If we apply for a credit card, a short-term loan or a longer-term mortgage, then a lender will assess our creditworthiness, before granting us access to their funds. They will make a judgement based on items such as our financial history, current salaries, savings, assets, overheads and disposable income. The summation of which will create our credit rating. That rating quantifies the lender’s belief that they will receive both the interest due and full repayment of a loan, throughout its lifetime. The higher your credit score, the more belief the lender has in you and your ability to repay their loan. A very similar process exists at a state or economic level. Specialist rating agencies, banks and brokers look very closely at a country’s finances and the trends in its economic data to determine just how good a credit risk that particular economy is. The AAA (triple A) rating or its equivalent, is the very best rating a country can hope for. It suggests that lending money to them is effectively risk-free. A good example of this status would be Switzerland which has had a coveted AAA rating for almost 30 years (hence the Swiss francs reputation as haven currency). A country’s credit rating directly affects a states cost of borrowing. The higher the perceived risk in lending funds to a country the more compensation the markets/lenders will demand. That compensation is, of course, the interest rate on the loan. As we saw earlier interest rates are mapped out along a yield curve, changes in which influence the value of a currency. A better a credit rating means lower interest rates, but that means a lower reward to holders of the local currency. Therefore, there is a direct tradeoff between receiving the best return on your money and getting your money back. Forex prices take these opposing forces into account, and are sensitive to changes in them as a result. In a free market, prices are determined by the interaction between buyers and sellers. Buyers represent demand for a particular commodity, product or instrument. While sellers represent the supply. If these two forces remain in equilibrium that is equally matched then the price of the underlying item will remain largely unchanged over time. However, if the relationship between supply and demand gets out of balance, then the underlying price will change in one of two ways. If demand exceeds supply, that is there are more buyers than sellers. Then price will rise to a point that is sufficiently attractive to tempt fresh sellers, or suppliers into the market. Alternatively, if supply exceeds demand (where there are more sellers than buyers), then the price will fall to a level that tempts new buyers, or demand into the market. These are the basic mechanics of price formation for any market. Of course, there may be many different factors that govern changes in supply and demand for these items, but the broad principles are the same regardless. When we talk about supply and demand in FX, we may be talking at either macro or micro levels. At the micro level supply and demand are represented by levels of support and resistance, tops and bottoms in price charts. Many forms of Technical Analysis are designed to track, capture and highlight changes in these relationships and the price points at which, they may change in future. At the macro level supply and demand can refer to the overall availability of a given currency, the wholesale supply if you will. In some senses, money or currency is valuable because it’s relatively scarce, ie it does not grow on trees. Effort or work is required to obtain money, and more work is required to make it grow. If a country decides to increase the supply of money to meet its obligations (pay its bills) then, historically, that was seen as being negative for the currency. Because an excess supply of money can create excess demand for goods and services, ie inflation (which as we noted earlier erodes the value or purchasing power of money over time.) Over the last decade however that relationship has broken down. As rates of inflation seem to have decoupled from the supply of newly printed money. Trillions of dollars worth of new money have been injected into the global economy via QE over this period, and yet inflation in many developed economies remains in low single digits and below targets in many quarters. The take away from this is that at a wholesale or macro level currencies retain their value while inflation remains low, regardless of the overall supply of that currency. But of course, this may turn out to be just a phase that lasts only as long as QE does. This factor is something of a wild card, in that markets try to ignore these influences when they can. If there is a stable domestic government, which has cordial relations with its neighbours and acts in unison with them, on issues of common interest. Then the markets are happy with that status quo. And to some extent, given the cyclical nature of politics, and the likelihood that unpopular or ineffective politicians, will be voted out of power, they can even overlook combative or disruptive influences, for a time. But they can’t ignore them completely or indefinitely. Recent examples of political risk directly influencing FX prices can be found in the election of Donald Trump as US President in November 2016. And the UK’s decision to leave the EU, in June that same year. The US Dollar initially rallied on Trump’s victory, but sold off in the months after that, as his unique approach to politics and diplomacy revealed itself, for all to see. Sterling depreciated by -12% in the aftermath of the Brexit, as the UK voted to overturn the existing order in Europe. Providing markets with an unpalatable cocktail of political risk and economic uncertainty. Though as some of the Brexit knowledge gaps were filled in Sterling rallied accordingly. Political risk looks likely to remain on the agenda for as long voters rebel against the existing order of things, and idiosyncratic individuals occupy positions of power. As a rule of thumb heightened political risk is negative for domestic currency prices. But eventually, even political risks can come to be the new normal, or status quo, and therefore those same risk ultimately lose their impact on the markets over time.